Let me guess.. you have a sweet tooth and you are going to Germany? 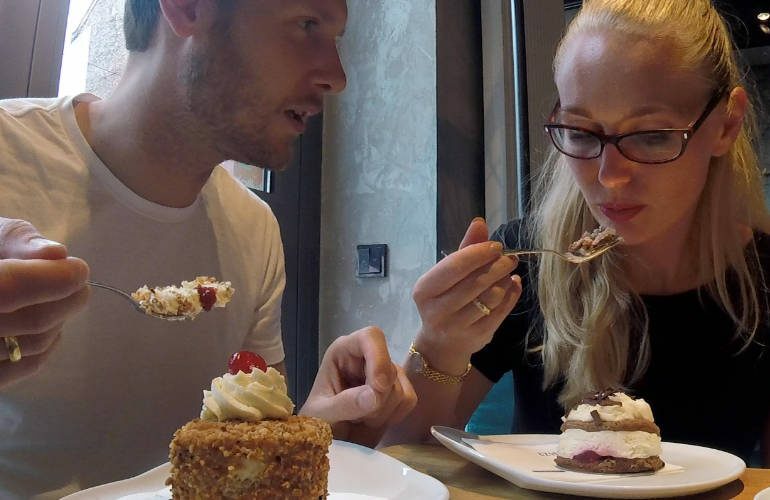 Today I am going to show you what cake specialities you should eat here for you “to eat” list! 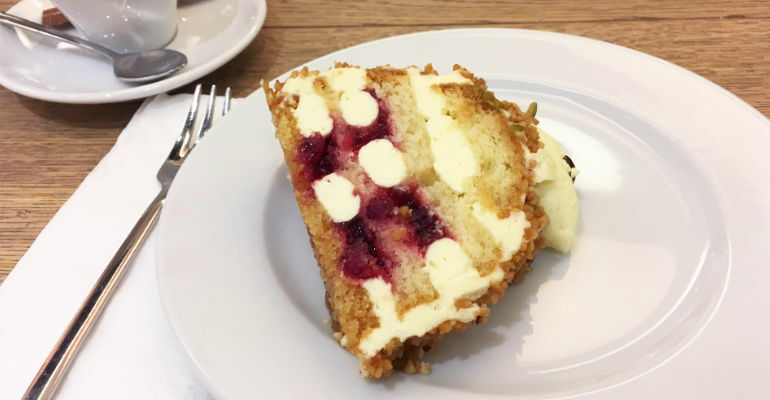 All the cakes that we feature here we have eaten in Frankfurt and below I will link the bakeries where we have found them! 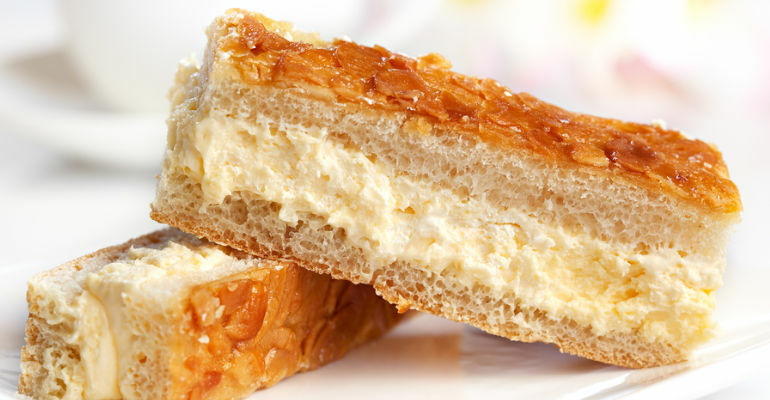 Bee sting cake is another yeast dough cake that contains 3 layers and caramelized almonds on the top. The caked is usually filled with buttercream. There are few legends about where the cake name comes from according to one, a bee was attracted to the cake, and the baker who invented the cake was stung. It is pretty ridiculous, but the cake tastes fantastic! Don’t even try to leave Germany without trying this German speciality! Traditionally the German crumb cake is made of a yeast dough covered with sweet crumbs – streusel. The crumbs contain all the goodies: sugar, butter, and flour. The crumb cake is usually flat cake and the crumbs make 50% of the height of the cake. Deliciousness! There are different variations of this cake, the basic one contains only the yeast dough and crumbs. 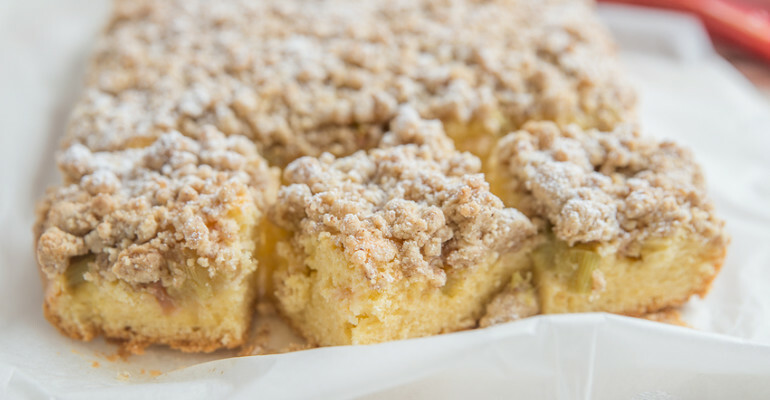 The one I love the most is apple crumb cake, which you can see in the image below. The apple pieces are placed between the crumb and yeast dough layer. In this crumb cakes, they were spiced with cinnamon – heaven in the mouth! The Frankfurt Crown Cake is my favourite cake of all German cakes! It is pretty heavy as it consists of buttercream, caramelized hazelnuts and sponge cake. The cake is decorated with cherries so it looks exactly like the jewels on the crown! Frankfurter Kranz has also a layer of red jam, usually strawberry or blackcurrant to level out the sweetness and sauerness. After eating it you will be done with eating sweets at least for a day! If you like chocolate, whipped cream and cherries this is a cake for you. Blackforest cake is lighter than the Frankfurt crown cake because it doesn’t contain buttercream. 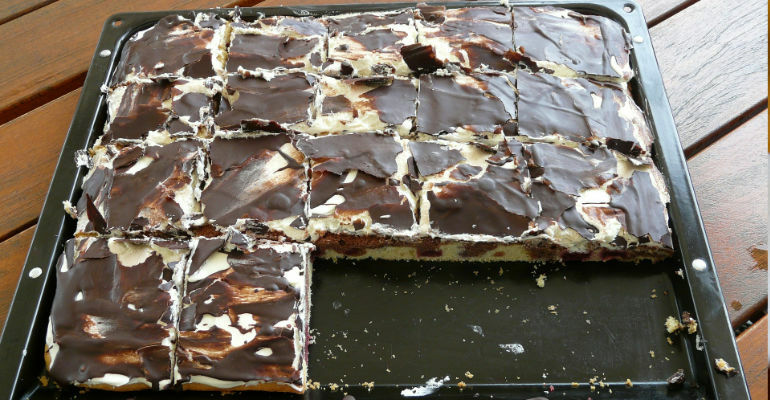 It is unsure where the black forest cake comes from, but one this is sure: this is one of the best-known German cakes and you cannot miss it on your trip to Germany. Marble cake consists or light and dark batter. The light one is usually vanilla one and the dark one – chocolate. The cake has a similar texture to the pound cake. Because it isn’t filled with any fruits or cream, the Germans usually serve them with cream on the side which is always a great idea! 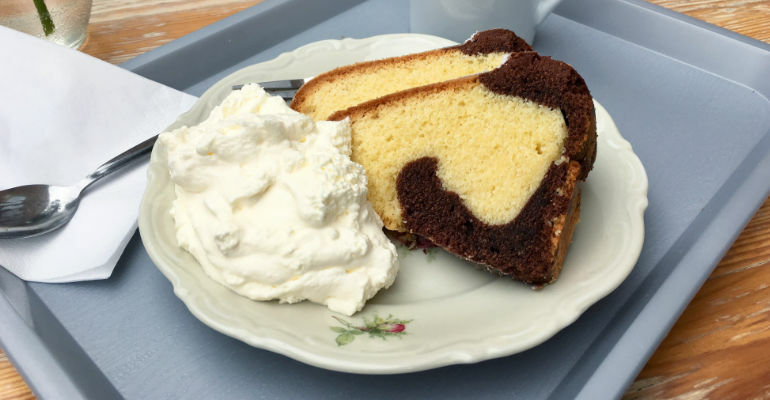 Donauwelle is traditional Austrian and German pound cake that has two layers: a plain one and a chocolate one. 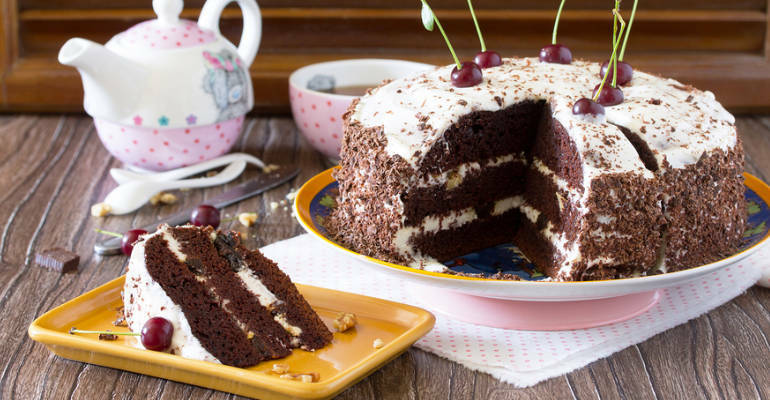 The layers combined have a wavy border between them caused by sour cherries that sink to the bottom of the cake during baking. After baking the cake is topped with buttercream and iced with a layer of chocolate. The chocolate is also ornamented with a fork in a wavy manner. In some parts of Germany, the has different names one of each is “Snow White Cake”. How cute! Donauwelle is very nice and refreshing, I can truly recommend you to try this cake on your trip to Germany!